It’s campy…..it’s silly…. and it loads of fun at the Hajime Robot Restaurant. This spot may be a bit off the beaten track, but it is the only place in Bangkok where you can be served and entertained by giant bug eyed robots dressed up like Japanese samurai. With automated touch screen menus located tableside, you can order a la carte or buffet style. 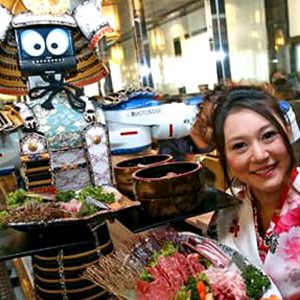 Hajime Robot Restaurant is definitely made for family fun and group dining so you'll want bring your camera and take photos of the robots while there. Unfortunately the 'production line' theme also extends to customers—there is a 1 hour and 45 minute time limit for dining. So it's really the kind of place where you get in, fill up, and leave. The easiest way to get there is to go to the Queen Sirikit MRT subway station and then take a taxi from there to Monopoly Park. Monopoly Park is located where the Industrial Ring Road merges with Rama III road. Hajime is on the 3rd Floor.